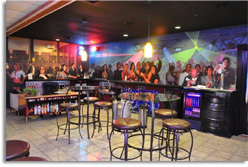 Are you looking for a free bartending school in DC or the Columbia, Ellicott City Glen Burnie or Baltimore areas of MD? If you are, then keep reading this page to find out where you can attend a bartending school that is located in your area. you can dial us at 410-787-0020 and we'll be happy to answer any general questions that you have. What are Bartending Classes Like? Bartending can be a fun job for those who enjoy talking to people and enjoy benefits like high earning potential and a dynamic, exciting work environment. Still, not everyone who would be ideal for the job may think that it's for them. By taking a class at a free bartending school, that person can easily decide whether or not they would like to be a bartender, though. A free lesson is a good way for a beginner to become associated with how bartenders in a number of settings, from night clubs to cruise ships and luxury resorts, operate day-to-day. At the very least, you can learn the basics of the profession. If you ultimately decide that bartending is for you, then a free introductory class is a good way to get acquainted with the school as well. The best schools will give you comprehensive lessons not just in the essentials like knowing how to mix the best drinks, but will also teach you things like customer service and familiarizing yourself with your state's local liquor laws as well. Where Can I Attend Free Bartending School DC? You should consider Maryland Bartendin Academy, the most prominent bartending school in the Maryland-DC area. Besides helping you with learn what you need to in order to get started on an exciting new career, we can also help you land your first job as well. Through our job placement program , we help our graduates find jobs often before they even graduate from our classes. Bar and restaurant owners all over the area have come to us time and again because of the quality training that we provide our students. That quality training comes from trained professionals who have been serving drinks for years and much of the instruction happens with a fully functional bar right in the classroom, so students are already familiar with many of the tools and items that they'll be using once they start working. If you're ready to begin a free bartending school in DC today, then contact us today by filling out this form. You can also call us at 410-787-0020 if you want to learn more. As an accredited member of the better business bureau with an A+ rating, we here at MBA can guarantee that you won't be disappointed.